An elk herd grazes as dusk settles in the Pennsylvania Wilds. Image by Derek Stoner. As the sun set amidst a wash of pink and gray clouds, distant lightning danced across the green-carpeted mountains. A herd of 45 elk grazed in the lush field before us, their reddish coats contrasting with the bright yellow of the wild mustard flowers. Hushed voices pointed out the bulls with the big antlers in velvet, and the many cow elk ready to give birth to their calves. While this scene is more-expected in Wyoming or Montana, our group from Delaware Nature Society experienced this sight just 225 miles from the First State. 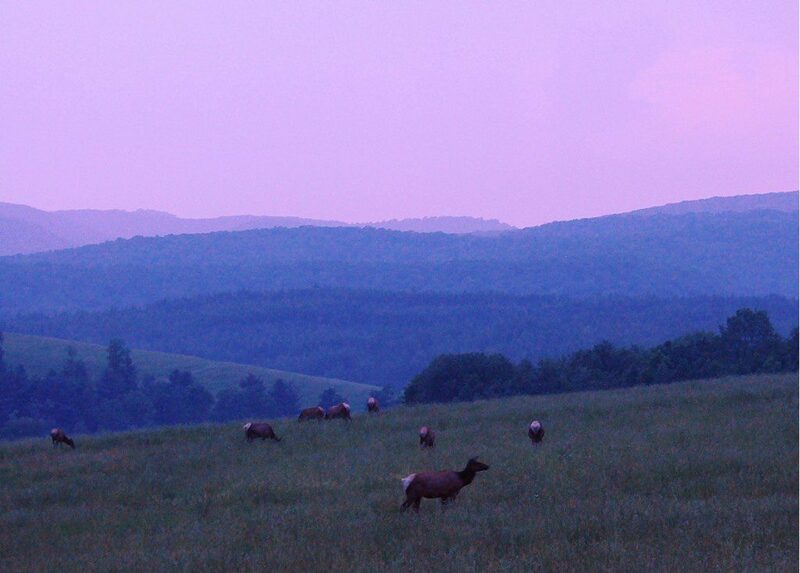 The Pennsylvania Wilds in north-central PA is home to the largest herd of elk in the East, and the scenery there is quite reminiscent of Western landscapes. Wide-open vistas, iconic wildlife, and stunning scenery abound. A very-pregnant cow elk, very ready to welcome a new calf. Image by Derek Stoner. After two wonderful trips in autumn to see the drama of the elk mating rituals, we decided to visit the Wilds in spring, for a sampling of “Spring Splendor.” Over the first weekend in June, Sheila Vincent and I led the tour of places near the litle village of Benezette, visiting natural areas like the Quehanna Wilds, Marion Brooks Natural Area, and Wykoff Run Natural Area. The elk herds gave us excellent close looks, as our first encounter found us within twenty yards of several cows whose bulging bellies signaled the impending arrival of baby elk. 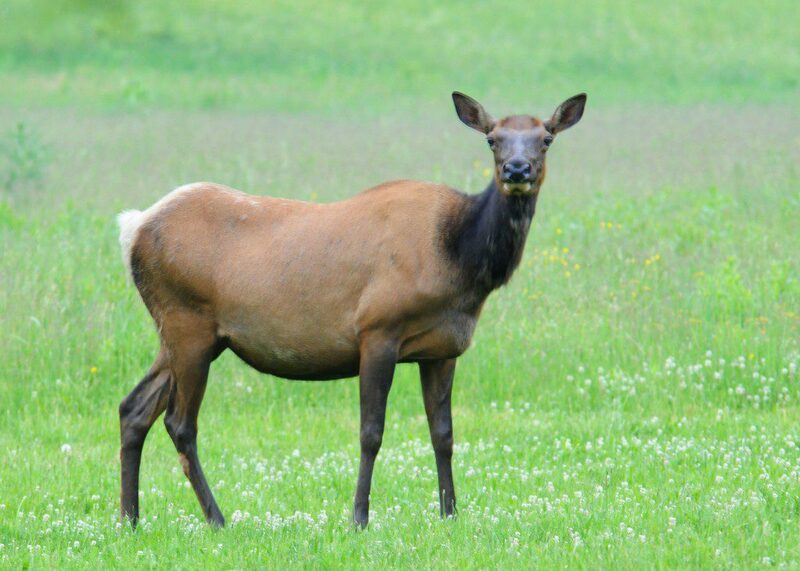 Perhaps these are the exact same lady elk we saw being courted by the battling bulls last September? A Mountain Laurel in full bloom in the Pennsylvania Wilds. Image by Derek Stoner. 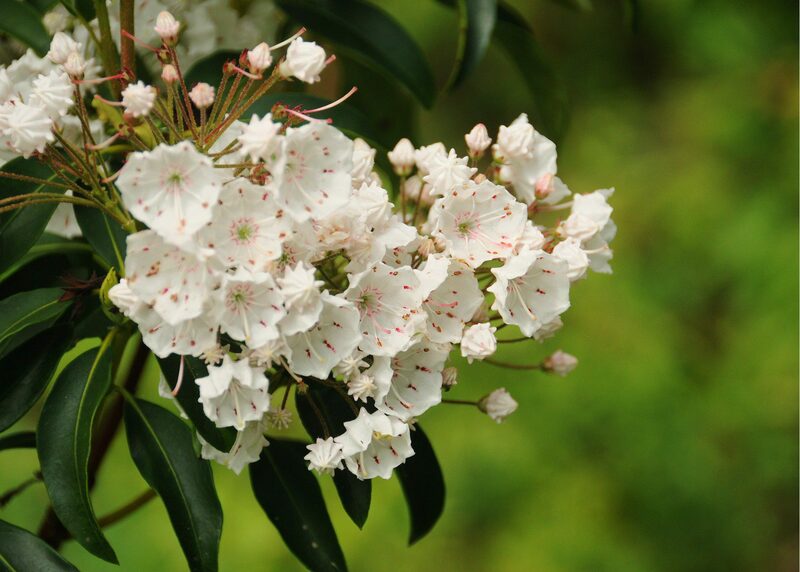 The wildflower show is fantastic in early June, and we hit the peak of the Mountain Laurel bloom. These beautiful bushes covered entire hillsides in pale pink blossoms, and the state flower of Pennsylvania lived up to its reputation as a delicate beauty. We reveled in the electric colors of Pink Lady’s Slipper, Devil’s Paintbrush, Blue-eyed Grass, and Gay Wings, while the subtle greens of ferns like Ostrich, Sensitive, and Cinnamon delighted the botanically-inclined. Wading through the waist-deep ferns in the largest white birch grove in Pennsylvania, we felt like we’d stepped into a prehistoric forest . 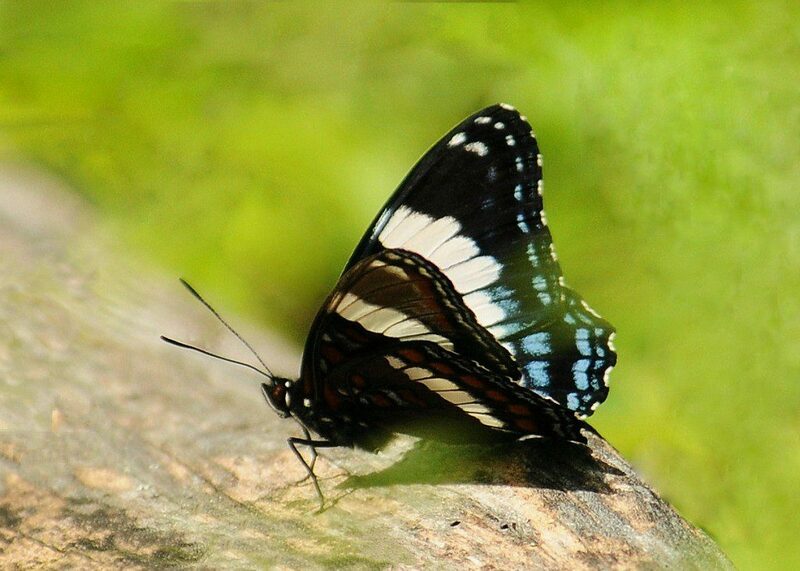 A White Admiral, with beautiful blue hindwings courtesy of hybridization with a Red-spotted Purple. Image by Derek Stoner. One of the best surprises of the trip is the encounter we had with an unusual butterfly: a hybrid cross between a White Admiral and a Red-spotted Purple. A new butterfly for everyone (including butterfly guru Sheila! ), we marveled at this insect’s combination of black, white, and electric blue. Other butterflies encountered include Spicebush Swallowtail, Little Wood Satyr, Common Ringlet, and Dreamy Duskywing. Spectacular looks at songbirds like Blackburnian Warbler, Magnolia Warbler, Chestnut-sided Warbler, Scarlet Tanager, Indigo Bunting, and Blue-headed Vireo rounded out our wildlife experience.